...is a boat with a real cannon. Don Craig of the Battle of Plattsburg Association and his friends actually built one, a reproduction of an American bateau, the workboats on American rivers throughout the 18th and 19th centuries. 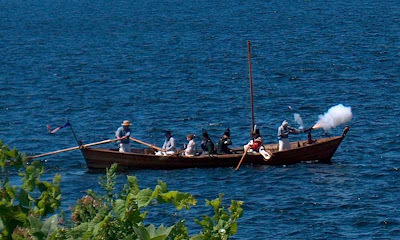 They use it to recreate the atmosphere of the last naval engagement on Lake Champlain, in 1814. And they get to fire that cannon. A great report on Duckworks Magazine.